Amerisite Land Survey, L.L.C. - Randy Donckers, mananger of Amerisite Randy Donckers performing a one Land Survey, LLC discusses land surveying man land survey using a blue tooth on "business Matters" tV show interview. Leica Robotic Total Station in Auburn. on "business Matters" tV show interview. Leica Robotic Total Station in Auburn. 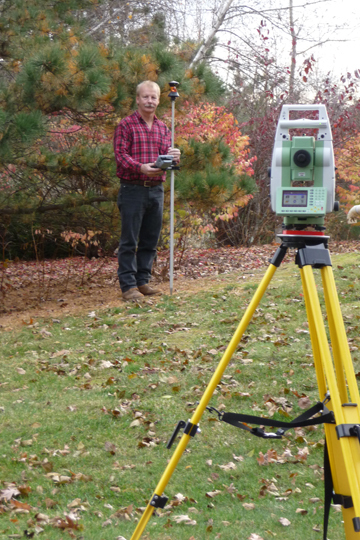 30 years of land surveying experience in New Hampshire and Massachusetts. Now utilizing the highest quality, latest technology, blue tooth robotic total station theodolite to perform the highest quality land surveys with a one man field crew to save you money. Award-winning drafting services utilizing the latest Carlson 3D computer aided drafting software to prepare high quality surveys at reasonable rates. Land Surveys for home owners, engineers, developers, attorneys, banks, real estate agents, and municipalities for residential, recreational, agricultural, industrial and commercial property in New Hampshire and Massachusetts, and Septic System Designs for home owners in New Hampshire. You will receive the best service that money can buy!